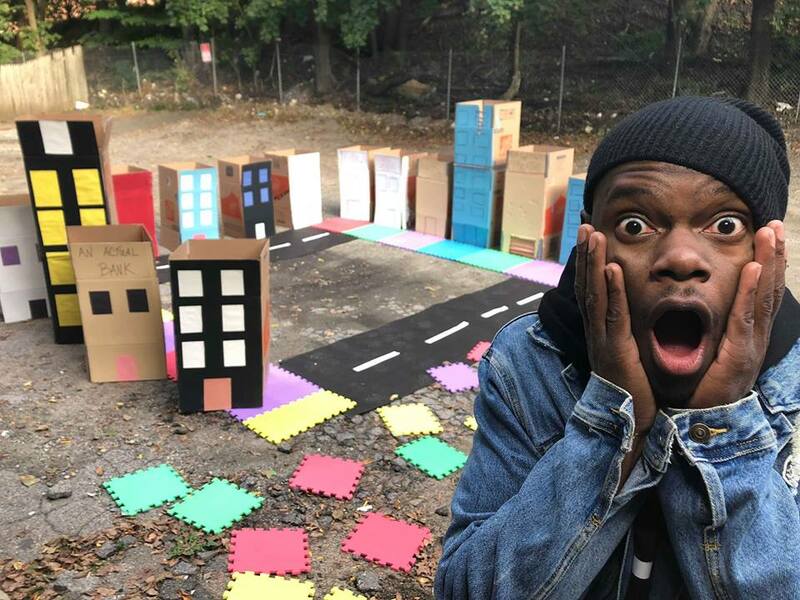 On Oct. 25 and 26 and Nov. 1 and 2, from 4 to 7 p.m., he’ll transform a former bank that’s now Dudley Neighbors Inc. at 572 Columbia Road, in Boston’s Uphams Corner neighborhood, into a game space of cardboard-box buildings. Participation is free. Drop in and play for five to 10 minutes. “You have two cardboard communities. One side is just beat up old boxes, not a lot of care is put into them,” garbage, Bullock explains. “A neighborhood in transition, a neighborhood people might get interested in buying property.” The other side offers “a pristine path” with carefully detailed buildings. The 29-year-old resident of Boston’s Roxbury neighborhood studied theater at the Boston Arts Academy high school. “That unlocked my creativity,” he says. But, he says, “While doing theater, I started to see it was kind of fake to me.” Specifically, when he was performing, the audience might embrace high ideals, “but the second we would come out into the lobby, everyone was back in their social group.” He wanted to make art that more directly fostered change. A few years back, he offered the “No Excuses Giveaway.” It was sparked by seeing an online fundraiser for a student going to Berklee College of Music seeking a laptop. “Instead of people having to make up these excuses—I want to make my art but I don’t have the tool to make my art”—Bullock just gave people computers, guitars, a midi controller, notebooks, pencils. “Then people actually started donating stuff to give to local artists,” he says. He invited nominations of local artists in need, then picked winners using a spinning game show wheel. Another time, he traveled to different neighborhoods around greater Boston, set up a couple chairs and offered “free conversations” with a game show wheel of topics: Boston, race, favorite songs. He’d play “The Price Is Right” theme song as he waited for participants. For the coldest day of one winter, Bullock transformed himself into a “Cold Buster” offering games, hot chocolate and hand warmers “to bring warmth to the city of Boston by any means necessary.” Another time, he invited people to a “Glow in the Snow Ball Fight” during one blizzard. During an overnight event at Boston’s Museum of Fine Arts in September 2016, he offered the 3 a.m. “Insomniac Olympics,” which challenged attendees to video games, Nerf gun marksmanship, duck duck goose. And he made videos for social media. His “Mid Day Dance Off Challenge” dared viewers to out dance him. Sometimes the spark is “I’m frustrated with something, let me make a video.” He pondered chivalry, argued that “the ‘Lion King’ is the greatest Disney movie of all time,” criticized lackluster black businesses. He had a viral hit with his “1st Snow Day of 2016!!! !” video in February that year, in which he freestyled “Boston Public Schools you’ve got a snow day” over the “Rocky” theme song. Facebook said it attracted 67,836 views and 964 shares. And it was featured on the website of NBC’s Today show. A video about breaking up with the MBTA attracted 25,000 facebook views and 429 shares. He interviewed Boston mayoral candidate Tito Jackson during last year’s city election. Two years ago, Bullock posted a video called “Dear Boston Luxury Condos.” As in many of his videos, it starts with him pulling up in his car and talking to the camera, then walking around Boston talking to the camera. “Who are these apartments for?” he asks, gazing around one Boston street. “Because they’re not for us. Everywhere I go I see brand new luxury apartments, luxury condos popping up everywhere, as far as the eye can see, but none of us can afford this.” Because of these luxury apartments and condos, he says, “the rent is going through the roof” for everyone else. According to facebook, the video was viewed 557,550 times, shared 8,958 times, and attracted 1,000 comments. One subtext of the project seems to say that some folks around here don’t really understand how gentrification is affecting people—and that’s a problem. “It’s weird. The easy answer is white people don’t understand it or the gentrifiers don’t understand,” Bullock says. “But there’s a lot of people who live in these communities who don’t understand it.” And then, he says, folks in a traditionally black neighborhood wake up to one day see white folks jogging by.